State University of New York Chancellor Nancy L. Zimpher today announced $18 million awarded to SUNY campuses throughout New York as a result of the university system’s Investment and Performance Fund, established with a first-of-its-kind investment by New York in the 2015-16 State Budget. Among those announcements: $18 million awarded to SUNY campuses throughout New York as a result of the university system’s Investment and Performance Fund, established in last year’s state budget. Zimpher says the awards will support SUNY’s Completion Agenda, which aims to boost the number of degrees awarded annually to 150,000 by 2020. Zimpher urged all New Yorkers to “Stand with SUNY” as it continues to let "systemness" and data drive its performance in service to students, faculty, staff, and the state. 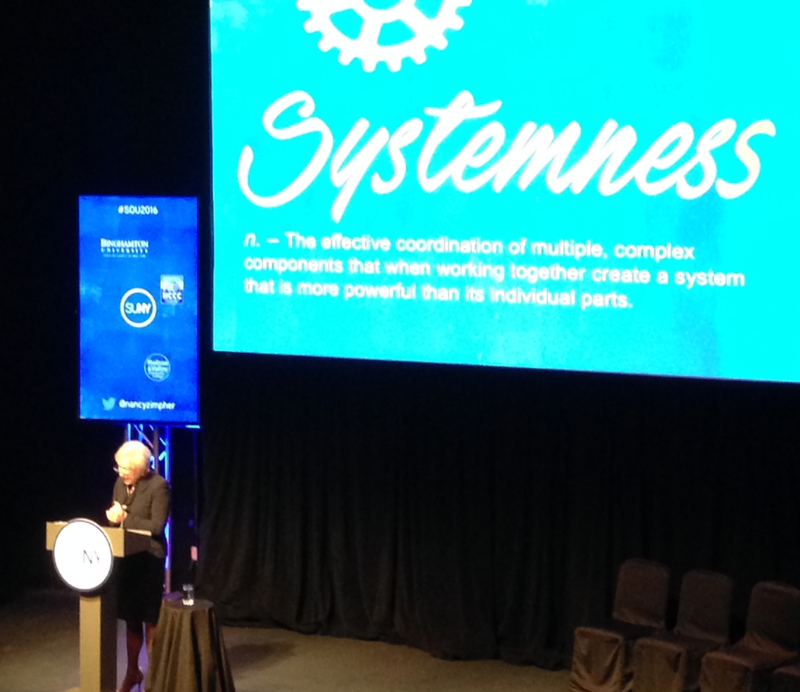 "Through systemness we've created and launched Open SUNY, the world's largest consortium for learning, with 472 online programs and 20,000 course sections, and we are still extending access to limitless numbers of people, anywhere in the world. Since its launch in 2014, more than 230,000 students have enrolled in Open SUNY classes." SUNY Board of Trustees Chairman H. Carl McCall says Zimpher’s vision for SUNY has far exceeded expectations. Zimpher is forging ahead with the concept. "All of these things, diversity training and performance measurement and shared services and cradle-to-career and seamless transfer — these are things SUNY wasn't doing at scale before systemness. But now we are. And it's making a difference." Zimpher introduced several new initiatives for SUNY in 2016, among them Open SUNY 2.0 and SUNY Path, Predictive Analytics Transforming Higher Education, which will aim to identify at-risk students and guide them toward completing their degree. New York's Lt. Governor Kathy Hochul is standing with SUNY: "I don't think there's a person in New York state that lives further than 30 miles from a SUNY campus. Is that true? 93 per cent of our population's within 15 miles, so you've no excuse. I mean you have a world-class affordable education right in your own communities, and that's the story we need to continue to tell." Locally, University at Albany President Robert Jones quickly released a statement supporting Zimpher’s goals. Jones says “the awards announced will greatly enhance UAlbany's student success and completion programs, and help us become an even stronger engine of opportunity for thousands of students from across New York state." Lt. Governor Kathy Hochul Friday announced a new $1 billion public-private partnership to bring high-speed broadband Internet service with at least 100 megabytes per second of service by 2018. American higher education is at a crossroads. Cost-minded students and their families--and the public at large--are questioning the worth of a college education, even as study after study shows how important it is to economic and social mobility. And as elite institutions trim financial aid and change other business practices in search of more sustainable business models, racial and economic stratification in American higher education is only growing. In American Higher Education in Crisis? : What Everyone Needs to Know, Goldie Blumenstyk, who has been reporting on higher education trends for 25 years, guides readers through the forces and trends that have brought the education system to this point, and highlights some of the ways they will reshape America's colleges in the years to come. Who gets to go to college? Who can afford it and what are you getting for your money? Is it smart to go into massive debt to get a degree? What is the future of education in America and what does that future mean for the workplace, the government, our children and colleagues, and for ourselves? In The End of College: Creating the Future of Learning and the University of Everywhere, education researcher and writer Kevin Carey shows how innovations in digital learning can help higher education.